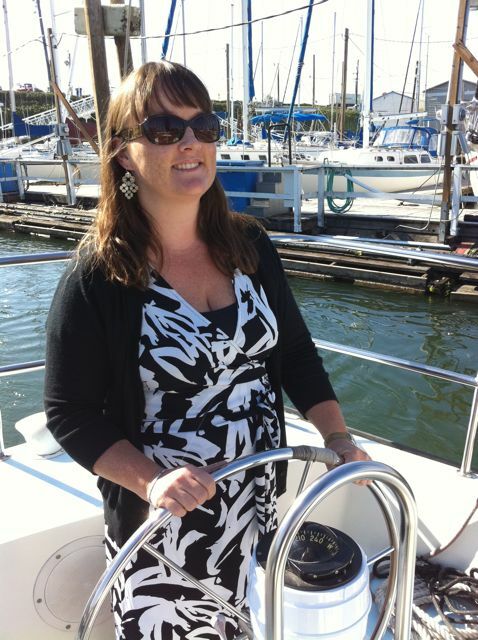 Ah, summertime! It’s that time of year to relax out on the porch, sip some lavender iced-tea, and watch the sun slowly dip behind the tree line. But if there’s one thing that can snap you straight out of that soothing summer bliss, it’s mosquitoes and other creepy crawlies found around your home! When you think of lavender, relaxation and restful sleep are usually the first things that come to mind. But along with its lovely floral aroma and soothing qualities, lavender is also effective at battling the bugs. Lavender pillows and sachets are wonderful in linen cupboards and chests of drawers and will keep away moths and other insects while leaving a fresh scent. Lavender oil can be sprayed from an atomizer or left in a saucer to help keep away ants and insects, and to disinfect the air. Not just a zesty addition to your tomato sauce, basil essential oil is ideal for summer pest control, especially if you live in a wet climate with lots of lakes and ponds. One study showed O. basilicum exhibiting both mosquito repellent and larvicidal activity. Basil is an uplifting oil, so add some to an atomizer and spray outside for a natural mosquito repellent and a well-deserved mood boost! Additionally, if you suffer from indoor allergies on those rainy, summer days, a 2014 study also concluded that practical dust mite control can be achieved with basil oil. Yet another reason to clean green with versatile essential oils! I think all of us can agree that the common housefly is one of the most aggravating creatures on the planet. If you’ve ever lived on a farm, these pests are even more of a headache! Lucky for us, thyme has been found to be a highly effective insecticide against houseflies. A 2005 study also found thyme to be an excellent mosquito repellent as well. Win, win! If you love camping but despise using Deet or other chemical bug sprays, pine is your perfect companion. A natural repellent against mosquitoes, pine will also keep you smelling fresh as the forest! In Java, Indonesia, sustainable vetiver essential oil production has produced a viable vetiver craft industry with items such as aromatic mats, baskets, candles, and soaps—all being produced from the spent root. 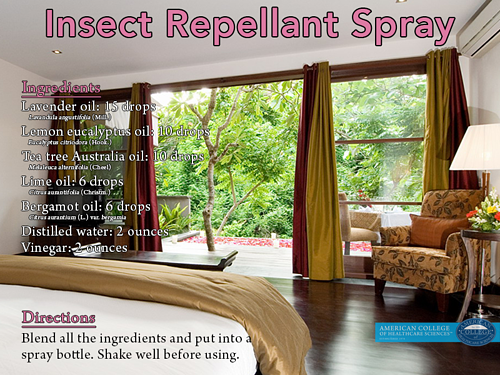 The added benefit is vetiver acts as a natural mosquito deterrent in the house. Diffusing a few drops of this oil will help repel the mosquitoes and also create a spicy, Balinese ambience for summer. Is there anything more “summery” than citrus? Bergamot is one of my favorite oils to use for green cleaning, and it’s also the perfect addition to your natural insect repellent spray as it adds a mood boosting, fruity lift. It’s important to note that bergamot is very phototoxic, so you should not use it outside as a topical insect repellent, but rather an aromatic insect repellent spray. If the bugs happen to make a meal out of you on those long summer evenings, bergamot is a wonderful oil for topical use on insect bites or stings (just keep out of the sun)! If you would rather a fresh and minty clean aroma in your bug spray than that icky chemical smell, peppermint is the perfect choice. Peppermint is a natural insecticide that kills as well as repels mosquitoes. In one study, M. ×piperita showed repellent action when applied to exposed body parts. It also displayed significant larvicidal and mosquito repellant action: Larvae of Culex quinuefasciatus were completely killed 24 hours after exposure (in water) to 3 ml of M. ×piperita per square meter of water. Apply to the area undiluted as often as needed. Will the wonders of Australian tea tree oil ever cease? Tea tree is not only a green cleaning powerhouse, but it is also an antiparasitic, capable of destroying or suppressing the growth of parasites such as fleas, leeches, lice, and ticks. Use diffusion or direct topical application. 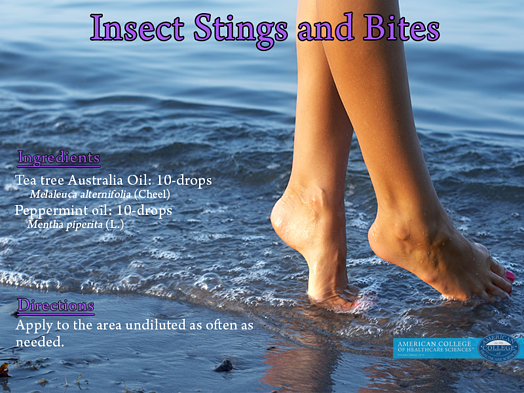 Like bergamot, if those nasty critters do make a meal out of you, Australian tea tree can help beat the irritation from bites or stings. A standard in any natural green cleaning kit, your eucalyptus essential oil can also be used as an insecticide. In a 2010 study, three species of eucalyptus (E. staigeriana, E. citriodora, and E. globulus) were tested for use with the blood-sucking sandfly, lutzomyia Lutzomyia longipalpis. Researchers found the eucalyptus essential oils were more effective against L. longipalpis than other natural products. As mentioned above, lemon eucalyptus E. citriodora can also be used as a natural insecticide—especially for those who love that citrusy smell for summer! It was also discovered that the distillate or hydrosol was very effective against mosquitoes and not as volatile as the essential oil. This could be a great essential oil mosquito repellent option for use around children and pets, since the hydrosol still provides very high protection from a broad range of insects over several hours. I was lucky enough to visit an essential oil lab run by the Ethiopian government when I visited the country in 2006. They were doing a lot of work with lemon eucalyptus essential oil as an insect repellant—critical in parts of the world where malaria is running rife! E. citriodora is an excellent resource as the tree grows quickly and has a fairly high yield of essential oil. Now that you have your oils ready to arm yourself against the bites and stings of summer, here is my favorite natural insect repellent recipe for keeping those bugs at bay. Happy summer! Blend all the ingredients and put into a spray bottle. Shake well before using. Note: Both bergamot and lime are photosensitive oils. This is an aromatic blend meant to be diffused into the air around you and is not intended for topical or internal use. How will you naturally beat the bugs this summer? Share your ideas in the comments! Chokechaijaroenporn, O., Bunyapraphatsara, N., & Kongchuensin, S. (1994). Mosquito repellant activities of Ocimum volatile oils. Phytomed 135-139. Perumalsamy H, Kim JY, Kim JR, Hwang KN, Ahn YJ. (2014). Toxicity of basil oil constituents and related compounds and the efficacy of spray formulations to Dermatophagoides farinae (Acari: Pyroglyphidae). J Med Entomol. 650-657. A., Kula J. 1993. The Possibilities of Essential Oils Utilization for the Limitation of Some Insect Populations or their Repellency. Programme Abstracts, 24th Int Symp Essent Oils. Park B.S., Choi W.S., Kim J.H., Kim K.H., Lee S.E. 2005. Monoterpenes from thyme (Thymus vulgaris) as potential mosquito repellents. J Am Mosq Control Assoc- Mar;21(1):80-3. Ansari M.A., Vasudevan P., Tandon M., Razdan R.K. 2000. Larvicidal and mosquito repellent action of pepper- mint (Mentha piperita) oil. Bioresource Technol 71:267-271. Maciel, M.V., Morais, S.M., Bevilaqua, C.M., Silva, R.A., Barros, R.S., et al. (2010). Chemical composition of Eucalyptus spp. essential oils and their insecticidal effects on Lutzomyia longipalpis. Vet Parasitol, 167(1):1-7. Epub 2009 Oct 9. This article was originally published in June 2014 and has been updated for accuracy on April 24, 2017.